Air Jordan 12s for a young fan straight from Drake. One young Drake fan appears to already have her pair of OVO x Air Jordan 12s locked down ahead of this Saturday's release of the limited sneaker. The girl in the above image, which went viral on Twitter, had a Drake-themed sixth birthday party over the weekend that drew the attention of the Canadian entertainer. 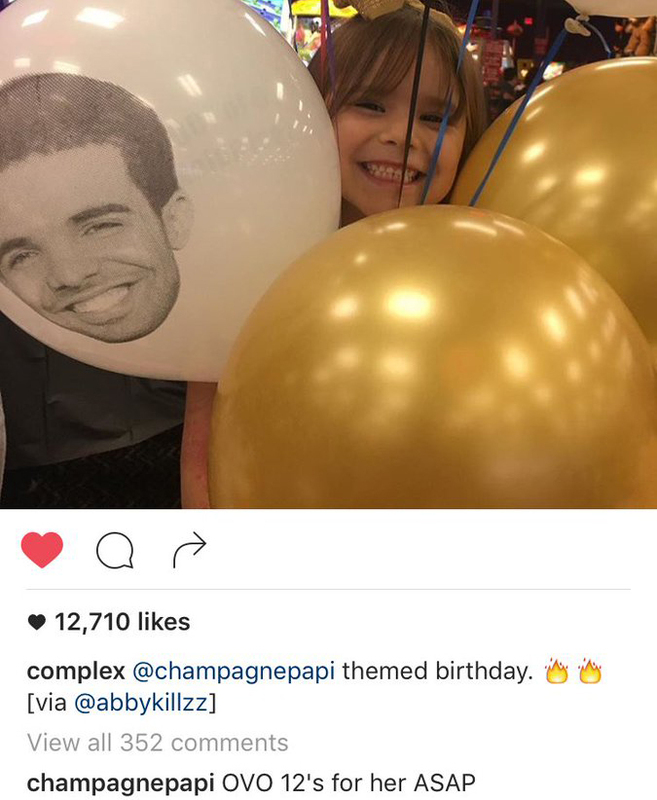 After Complex reposted the image of the young girl and her Drizzy balloons on Instagram, Drake himself commented "OVO 12's for her ASAP." As far as we know the sneakers only come in men's sizes, but perhaps Drake will pull some strings over at Jordan Brand and have a special pair made for this young fan. If he does indeed come through, this just might be the most random sneaker seeding moment of all time.